Gaul was a region of Western Europe during the Iron Age that was inhabited by Celtic tribes. Coinage in Gaul started with the Greek colonies of Massalia, Emporiae, and Rhoda - and designs from these three cities were widely copied across southern Gaul. Northern Gaulish coins were especially influenced by the coinage of Philip II of Macedon and Alexander the Great. 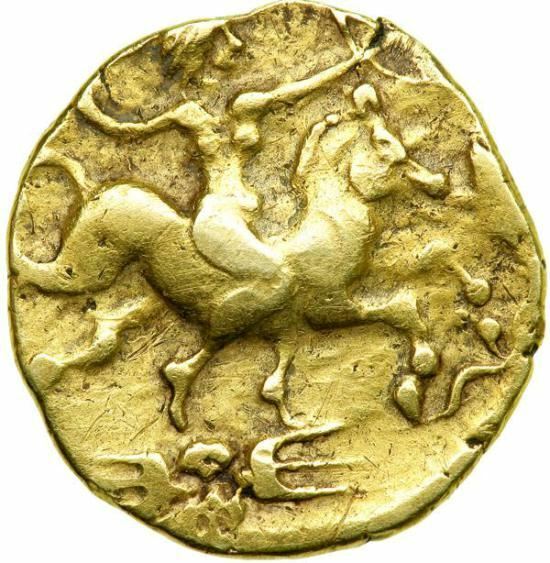 Celtic coins often retained Greek subjects, such as the head of Apollo on the obverse and two-horse chariot on the reverse of the gold stater of Philip II, but developed their own style from that basis, allowing for the development of a Graeco-Celtic synthesis.